Are you enjoying your day off? Hubby always has Monday's off, so it's no real treat for him!! So he's out in the garage cleaning it up and I am inside playing with paper and baking!! Yummy. So today, I have two cards to share with you. So every Monday, From the Heart has a new challenge posted for you to play with and I LOVE sketches. So I could not pass the up playing with this weeks sketch. I love how well the paper matches with the image. The image is called Balancing Hearts and I have colored it using my Copic Markers. The patterned paper is from MME: Springtime. The cardstock is by Recollection and SU: So Saffron and buttons are PTI. EVERYONE who enters will receive $1 to FromTheHeartStamps.com. Use it as a discount, or save them up to earn a free stamp. I'll have a new sketch for you next week. Linky will close on Sunday at 10PM EST. Join us on Facebook and “Like” our page to see sneak peeks of the next sketch. So there there you have it. I hope that you will join us this week, for a chance to win $5 GC to the From The Heart Store. Make sure to check out the rest of the amazing cards created by the rest of the team. And my second card was a just because card. I love cards with just sentiments on the front and with strong messages. This is a favorite quote of mine and was excite to see Faith had it. 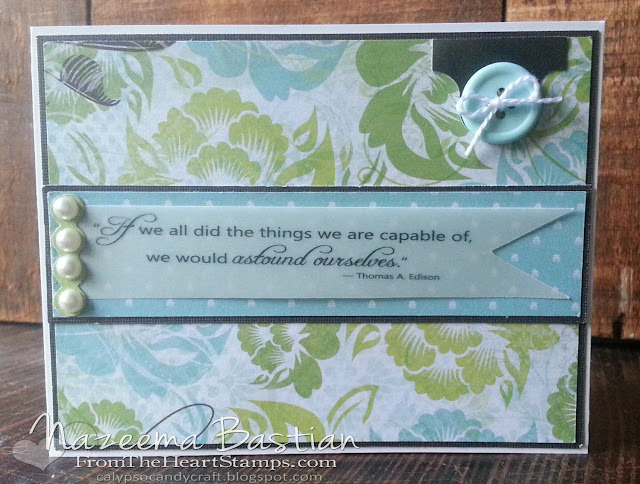 It is part of the Possibilities Sentiment Pack. I used KaiserCraft: Chapter One paper. I love the blue/green and the hint of black. 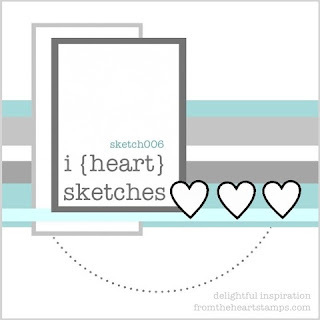 For this card I am using My Favorite Things Sketch #111. Terrific cards and great papers! I love the balancing hearts image and sentiment. Glad you played along with us at Created With Love Challenges. 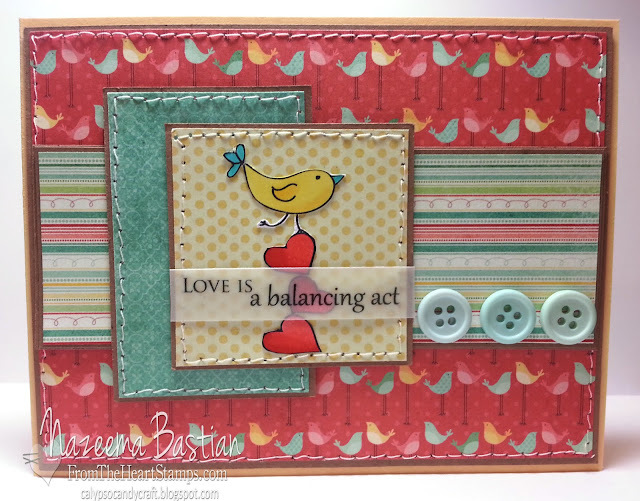 I so love your birdie card! How cheery, it would make anyone want to smile! Love the fresh feeling of your second card to! How pretty! I loved the perfect image for Valentine's Day!Thanks for joining us at Card Mania Challendges. love your stitching on the card very nice job. Wow Great Card love the birds and the buttons. thanks so much for playing along with us at Created with Love Challenges. Gorgeous card! Pretty image, beautiful colours. Thanks for joining us at Card Mania Challenges. Good luck and hope you'll join us again. Gorgeous! love the image and the Sketch! Thanks for joining us this week at Created With Love Challenges for our Things that Fly Challenge! Oh how cute, and I love that gorgeous paper. Thanks for sharing at Created with Love, Sandra. Really cute bird card - stitching is terrific as well as the layout, colors and DSP you used. Thanks so much for joining us this week at 'ABC' Challenges.